Kotka is a city and municipality of Finland.Kotka is located on the coast of the Gulf of Finland at the mouth of Kymi River and it is part of the Kymenlaakso region in southern Finland. Start off your visit on the 26th (Fri): contemplate the long history of St. John's Church, make a trip to Hamina Fortress, take in the architecture and atmosphere at Saint Peter and Saint Paul Cathedral, steep yourself in history at Hamina Town Hall, then identify plant and animal life at Riverside Park, and finally steep yourself in history at Kotka Church. To see more things to do, maps, and more tourist information, go to the Kotka visit planner . Birmingham, USA to Kotka is an approximately 17.5-hour flight. The time zone difference when traveling from Birmingham to Kotka is 8 hours. When traveling from Birmingham in July, plan for cooler days in Kotka, with highs around 70°F, while nights are slightly colder with lows around 55°F. Wrap up your sightseeing on the 26th (Fri) to allow time to drive to Naantali. Naantali is a town in south-western Finland, known as one of the most important tourist centres of the country. Start off your visit on the 27th (Sat): kick back and relax at Ispoinen Beach and Sauna, see the interesting displays at Luostarinmaki Handicrafts Museum, then take in the spiritual surroundings of Turku Cathedral, and finally explore the galleries of Aboa Vetus & Ars Nova. 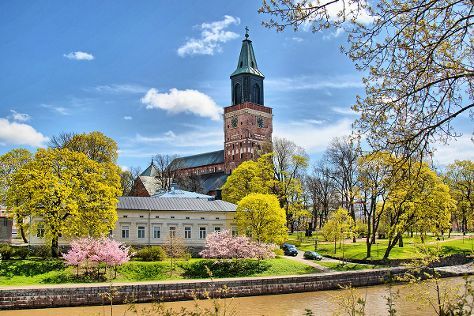 On the 28th (Sun), you'll have a packed day of sightseeing: explore the historical opulence of Turku Castle, then get your game on at Moomin World, and then hike along The Archipelago Trail. For other places to visit, photos, where to stay, and more tourist information, use the Naantali trip planner . You can drive from Kotka to Naantali in 3.5 hours. Other options are to do a combination of train and flight; or do a combination of bus and train. Expect a daytime high around 70°F in July, and nighttime lows around 52°F. Finish your sightseeing early on the 28th (Sun) so you can drive to Jyvaskyla. Jyväskylä is a city and municipality in Finland and in the western part of the Finnish Lakeland. Kick off your visit on the 29th (Mon): test your team's savvy at popular escape rooms, look for gifts at Punnitse & Saasta, then examine the collection at The Craft Museum of Finland, then get a new perspective on nature at Natural History Museum of Central Finland, and finally view the masterpieces at Kuokkalan kartano. To see other places to visit, ratings, where to stay, and tourist information, read our Jyvaskyla trip planning site . You can drive from Naantali to Jyvaskyla in 4 hours. Alternatively, you can take a train; or fly. In July, daytime highs in Jyvaskyla are 69°F, while nighttime lows are 51°F. Wrap up your sightseeing on the 29th (Mon) early enough to drive to Oulu. Oulu is a city and municipality of inhabitants in the region of Northern Ostrobothnia, Finland. 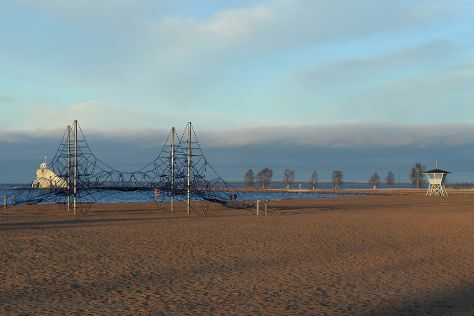 On the 30th (Tue), identify plant and animal life at Hupisaaret Park, kick back and relax at Nallikari Beach, and then head outdoors with Oulu Climbing Centre. To see traveler tips, ratings, photos, and more tourist information, read Oulu travel route planning website . You can drive from Jyvaskyla to Oulu in 4.5 hours. Alternatively, you can fly; or take a train. In July, daily temperatures in Oulu can reach 68°F, while at night they dip to 54°F. You will have some time to spend on the 31st (Wed) before leaving for home.